The Chrysler B and RB engines are a series of big-block V8 gasoline engines introduced in 1958 to replace the Chrysler FirePower (first generation Hemi) engines. The B and RB engines are often referred to as "wedge" engines because they use wedge-shaped combustion chambers; this differentiates them from Chrysler's 426 Hemi big block engines that are typically referred to as "Hemi" or "426 Hemi" due to their hemispherical shaped combustion chambers. Design features of the B and RB engines include 17 capscrews per cylinder head, a cylinder block that extends 3 in (76.2 mm) below the crankshaft centerline, an intake manifold not exposed to crankcase oil on the underside, stamped-steel shaft-mounted rocker arms (race versions used forged steel rockers), and a front-mounted external oil pump driven by the camshaft. The 'B' series wedge engine was introduced in 1958 with 350 cu in (5.7 L) and 361 cu in (5.9 L) versions. The 361 would continue in production until the end of the series, albeit only for truck installation. The RB ("raised B") arrived one year after the launch of the B series engines, in 383 cu in (6.3 L) and 413 cu in (6.8 L) displacements. Unlike the previous B-engines, which had a 3 3⁄8-inch (85.7 mm) stroke, the RB engines had a 3 3⁄4-inch (95.3 mm) stroke. For 1960, a "ram induction" system increased the 413's torque up to 495 lb⋅ft (671 N⋅m) on the Chrysler 300F versions. The last 'B-RB' wedge-headed engine was produced in August 1978, ending the era of Chrysler "big-block" engines. All Low Block B-series engines have a 3 3⁄8 in (85.7 mm) stroke, a 9.98 in (253 mm) deck height and 6.358 in (161.5 mm) connecting rods, resulting in a 1.88:1 rod ratio. The 361 cu in (5.9 L) B engine also introduced in 1958 was essentially the same as the 350 except with a larger 4 1⁄8-inch (104.8 mm) bore. In 1964, the Dodge Polara 500 came standard with a 315 bhp (235 kW) version of the 361 that had a four-barrel carburetor, dual-point distributor, and dual exhausts. Plymouth called their versions of the early B engine the Commando, variants of which included the Golden Commando and Sonoramic Commando. It produced 305 bhp (227 kW). DeSoto's B engine was named Turboflash and produced 295 bhp (220 kW). The Dodge standard version was a 2-barrel with 295 bhp (220 kW) called the Super Red Ram with an optional variant that was called the D500 and produced 320 bhp (239 kW). The 361 would last until the end of the series, albeit for trucks only. In its early years, the 305-horsepower 361 was optional on many vehicles, and standard on, among others, the Dodge 880. The 361 had a fuel injected version in 1958 only. Very few of the fuel injected B engines were made and only a handful remain, since most were brought back to the dealer to be fitted with carburetors. The 383 cu in (6.3 L) B engine—not to be confused with the RB version— was essentially a larger bore version of the 350 and 361, using a 4.21 in (106.9 mm) bore. This venerable engine was introduced in 1959. Dodge's version, the D500 had a cross-ram induction manifold and dual 4-barrel carburetors as options. In some Dodge applications, this engine was labeled as the Magnum, while the Plymouth's version was called the Golden Commando. Both came with a dual point distributor in high-performance versions. Producing a maximum of 330 hp (246 kW; 335 PS) (gross) and 460 lb⋅ft (624 N⋅m) of torque for the 1960 model year, the 383 beat the 392 Hemi that had reached 435 lb⋅ft (590 N⋅m). The 1960 383 engines featured the same basic ram induction system as the Chrysler 300F's 413 RB engines (named Sonoramic Commando when sold in Plymouth form). The later 383 Magnum (starting in 1968) used the 440 Magnum heads, camshaft, and exhaust manifolds. This engine was advertised at 335 hp (250 kW; 340 PS). The 400 cu in (6.6 L) B engine was introduced in 1972 to replace the venerable 383, and were power-rated via the net (installed) method. Chrysler increased the bore size of the 383 to create the 400. Its bore of 4.342-inch (110.3 mm) was the largest used in any production Chrysler V8 at the date of its introduction. All parts except for the pistons were interchangeable between the 383 and 400. Crankshafts were of cast iron composition. Three versions of this engine were available: a two-barrel/single exhaust version producing 170 hp (127 kW; 172 PS) at 4,400 rpm with 305 lb⋅ft (414 N⋅m) of torque at 2,400 rpm, a four-barrel/single exhaust version producing 205 hp (153 kW; 208 PS) at 4,400 rpm, and a high performance four-barrel/dual exhaust version rated at 260 hp (194 kW; 264 PS) at 4,800 rpm, 410 lb⋅ft (556 N⋅m) of torque at 3,200 rpm. All three versions used the same 8.2:1 compression ratio. The 400 was used in car, truck, and motorhome chassis. Horsepower and torque ratings gradually declined through the years due to the addition of more federally mandated emissions controls, until all Chrysler passenger vehicle big-block production ceased in 1978. For its last year of production, it only produced 190 hp (142 kW) (although a heavy-duty version was also available). 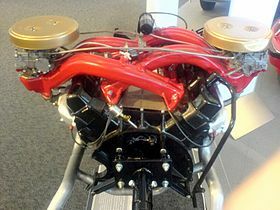 Due to its large factory bore size, short (compared to RB engines) deck height, and bottom end strength that is greater than any other production B or RB engine due to extra material added around the main bearing caps, 400 B engine blocks have become a popular choice for high-performance engine build ups. The RB engines, produced from 1959 to 1979, are Raised-Block (taller) versions of the B engines. All RB engines have a 3 3⁄4 in (95.3 mm) stroke, with the bore being the defining factor in engine size. All RB wedge engines share a deck height of 10.725 in (272.4 mm), and were fitted with 6.768 in (171.9 mm) long connecting rods, resulting in a 1.80:1 rod ratio. Bore center distance is 4.8 in (120 mm). All RBs are oversquare. Not to be confused with the 383 B engine, the 383 RB had a 4 1⁄32-inch (102.4 mm) bore (with the long stroke of 3 3⁄4-inch (95.3 mm)) for a displacement of 383 cu in (6.3 L). It was only available in 1959 and 1960 on the US-built Chrysler Windsors and Saratogas; one of Trenton Engine's lines had been converted to the new RB engine (to make the 413), and demand for the 383 B engine was too high for the remaining line. The solution was to create a 383 RB to fill the gap until the plant figured out how to quickly switch from one block to the other. In the 1959 Chrysler 300E the 413 wedge was fitted with inline dual 4-barrel carburetors; it was factory-rated at 380 bhp (283 kW) at 5000 rpm and 525 lb⋅ft (712 N⋅m) at 3600 rpm. In 1960, a long-tube ram induction system was made standard on the Chrysler 300. It continued as standard on the 1961 300-G, and remained on the option sheets for Chrysler 300s through 1964. In 1962, a special version known as the "Max Wedge" was made available for drag racing and street use; this version produced 420 bhp (313 kW) at 5000 rpm. Not to be confused with the 426 Hemi, the 426 cu in (7.0 L) RB was a wedge-head RB block with a 4.25 in (108 mm) bore. The 426 Wedge served as Chrysler's main performance engine until the introduction of the 426 Hemi. It was initially offered as the "non-catalogued" option S42 in Chryslers (the number of such produced is uncertain), offered with 373 or 385 hp (278 or 287 kW) via a single 4-barrel carburetor (11.0:1 or 12.0:1 compression ratio, respectively), or 413 or 421 hp (308 or 314 kW) via ram-inducted dual 4-barrel carburetors (with the same compression ratios). For 1963, horsepower ratings would slightly increase (see below), and it became optional in B-bodied Dodges and Plymouths. After 1963, it would be used only in Dodges and Plymouths. The Max Wedge was a race-only version of the 426 Wedge engine offered from the factory. Known as the Super Stock Plymouth and Ramcharger Dodge, the Max Wedge featured high-flow cylinder heads developed through state-of-the-art (at the time) airflow testing. They had 1⅞-inch exhaust valves, which required the cylinder bores to be notched for clearance. The blocks were a special severe-duty casting with larger oil-feed passages than other RB engines, and the blocks were stress-relieved by the factory. Induction came by means of a cross-ram intake manifold tuned for peak power above 4000 rpm and two Carter AFB-3447SA 4-barrel carburetors. The Max Wedge also included high-flow cast-iron exhaust manifolds that, on the later versions, resembled steel tube headers. The Max Wedge was factory rated at 415 or 425 bhp (309 or 317 kW) (depending on compression), and 480 lb⋅ft (651 N⋅m) at 4400 rpm. The 440 cu in (7.2 L) RB was produced from 1965 until 1978, making it the last version of the Chrysler RB block. It had a light wall construction, precision cast-iron block, with iron heads and a bore of 4.32 in (109.7 mm), for an overall displacement of 440 cu in (7.2 L). From 1967 to 1971, the high-performance version was rated at 375 bhp (380 PS; 280 kW) (370 bhp (375 PS; 276 kW) in 1971) at 4,600 rpm and 480 lb⋅ft (651 N⋅m) at 3,200 rpm of torque with a single 4-barrel carburetor, and from 1969 to 1971, the highest-output version had an intake setup with 3X2-barrel Holley carburetors ("440 Six Pack" for Dodge, "440 6-BBL." for Plymouth) producing 390 bhp (395 PS; 291 kW) at 4,700 rpm (385 bhp (390 PS; 287 kW) in '71) and 490 lb⋅ft (664 N⋅m) at 3,200 rpm of torque. The high-output 440 (4-barrell/mild cam/dual exhausts) was marketed as the Magnum in Dodges, the Super Commando in Plymouths, and the TNT in Chryslers. From 1972 to 1974 the engine (detuned to run on lead-free gas) was rated at 280 hp (209 kW) net, and dropped in hp each year until 1978, when it was rated at 255 hp (190 kW) (in police specification) and limited to Chrysler New Yorkers, Chrysler Newports, Dodge Monaco Police Pursuits, and Plymouth Fury Police Pursuits. It was also available in marine and heavy-duty commercial applications until that year. Chrysler also offers complete new 'crate' engines through its Mopar parts division in various displacements, these engines are built from entirely new parts. ^ "The B Engines: 350, 361, 383, and 400". Allpar.com. Retrieved January 4, 2016. ^ Smale, Ian (19 October 2008). "Chrysler Products in Canada, Eh. (1957- 1961)" (PDF). p. 5. Retrieved 4 January 2015. ^ Lee, John (1990). Standard Catalog of Chrysler, 1924-1990. Krause Publications. pp. 192, 313. ISBN 0-87341-142-0. ^ "Everything you've ever wanted to know about B/RB blocks and more..." 440Source.com. Retrieved January 4, 2016. ^ a b Atherton, Larry (1978). Mopar Performance. S-A Design Publishing. ^ Godshall, Jeffrey I. (December 1994). "1960-62 Chrysler "Positively No Jr. Editions"". Collectible Automobile: 57. ^ Flory, Jr., J. "Kelly" (2004). American Cars 1960–1972. McFarland & Coy. p. 220. ^ Lösch, Annamaria, ed. (1981). World Cars 1981. The Automobile Club of Italy/Herald Books. p. 234. ISBN 0-910714-13-4. ^ "Dodge Charger R/T, 1969 MY XS29". carfolio. Retrieved July 11, 2018. ^ "1970 Plymouth Road Runner 440 6-bbl Hardtop 4-speed". automobile-catalog.com. Retrieved June 24, 2018. Wikimedia Commons has media related to Chrysler B engine. This page was last edited on 5 April 2019, at 15:46 (UTC).